We finished up with the walking tour about 3:45. We did a bit of shopping in the French Market, and then planned to go to the Southern Food and Beverage Museum for the opening night party for the Roadfood Festival. I had hoped that if we showed up early, we could get admitted early so that I could peruse the museum before the party started. Lori wanted to get a cab, because we'd been walking a lot and our legs were tired. Google Maps said that it would take us about 15 minutes to walk there, so I proposed that we start walking and hail a cab if we saw one. Unfortunately, Google Maps didn't accurately estimate our walking speed, and it didn't even get the right location. It ended up taking us about 40 minutes to finally get to the museum; we arrived just before the festivities started, with a mighty yearning to sit down. 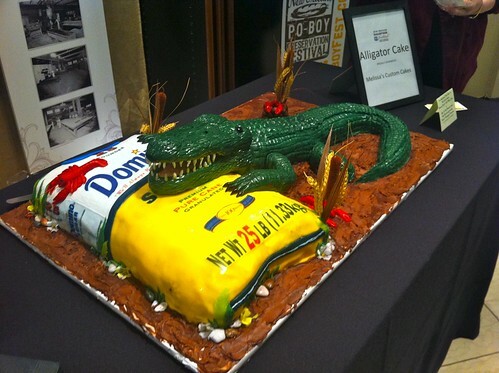 The first food we saw was the extraordinary alligator cake made by Melissa's Custom Cakes, who had made the Crawfish Boil cake last year. Lori paid more attention to the construction of the cake than I did; she reports that Melissa uses melted chocolate over buttercream frosting, which gives a better flavor than fondant. Once the cake was finally cut, it was revealed to be a buttery pound cake alligator and a rich, moist chocolate bag of sugar. Gumbo from Prejean's. 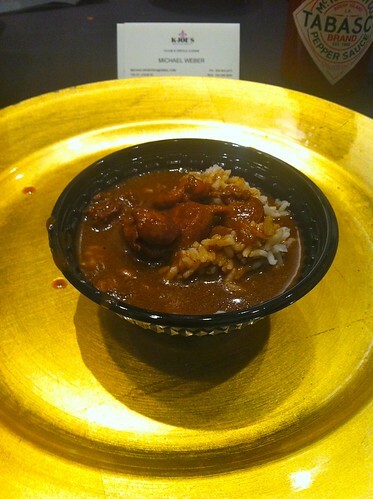 This at least was served with rice, but I didn't notice the rich medley of flavors that I want from gumbo. I'm pretty sure this is a roux-based gumbo from the color, but I don't remember much else about it. Now, others judged the same gumbo much better - so maybe I was missing something. 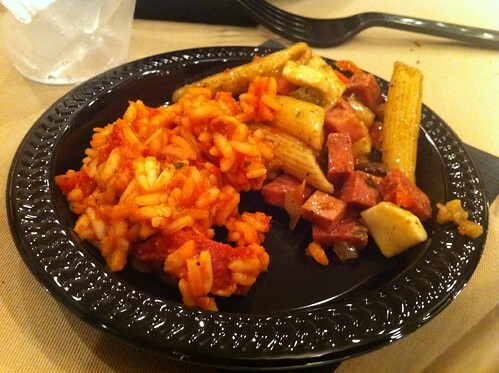 Jambalaya and muffaletta pasta salad from K-Joe's. Again, though this was pretty good, I don't remember it well. 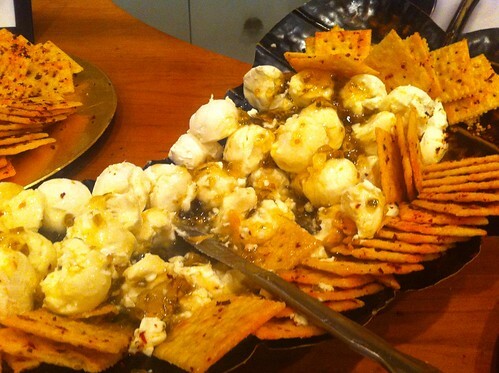 The cheese crackers from K-Joe's were much more memorable, though. They reminded me of Cheez-its, but much zestier and spicier. Smearing the cracker with a bit of the cream cheese and jalapeno jelly actually spread out the flavors and slowed down the heat without diminishing it. There was an oyster boat as well. I'm still learning to like raw oysters, but I liked these as much as the ones Chris shared with me in North Carolina, with less garnishes. 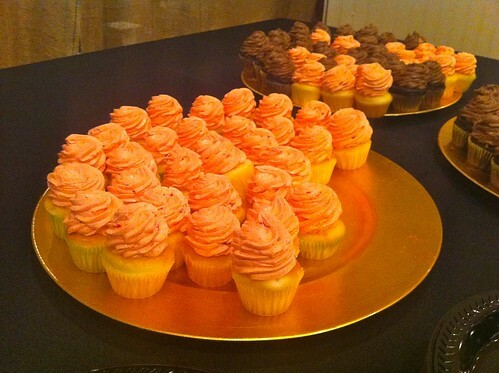 Lori really liked the mini cupcakes from The Cupcake Company. They were good cake with thick, creamy, rich frosting that was as high as the cake. I apparently neglected to take a photo of the Lasyone's meat pies. They were small, just a few inches long, but filled with a rich warm savory meat mixture. I loved the size as much as the taste. I suggested that they serve those pies at the Roadfood festival, but the lady providing them said that they were too labor-intensive to make in the quantities required for the festival. I also sampled the cracklins without taking a picture. These cracklins were fatty and fibrous; they did not make a fan out of me. I had hoped to get crawfish in the shell at the party, because there had been crawfish last year and I'm still at a stage such that a few crawfish is the right amount. But there were none. 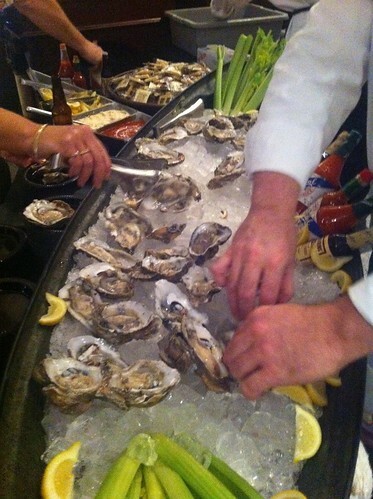 One difference I noted between this year's party and last year's: all the food was local to Louisiana this year. I have no judgment on whether that's good or bad; I liked the nationwide flavor of last year's party, but some of last year's more distant foods did not travel well. 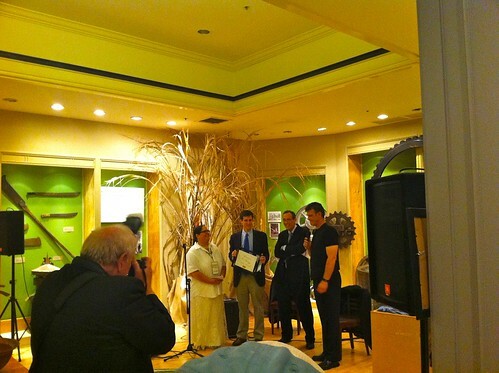 The big event of the evening was presenting the Blue Plate Award to Wayne Mueller of Louie Mueller's Barbecue. Wayne gave a very touching, incredibly humble speech, giving the credit to his grandfather and father who ran the restaurant before him, clearly showing that he felt honored to carry on that legacy. As the party started to wind down a bit, I turned my attention to the museum itself. 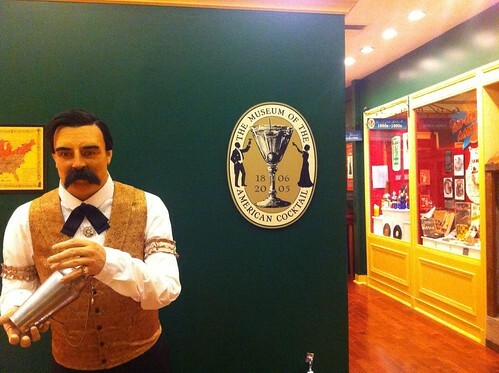 I skimmed over the room with absinthe bottles and paraphernalia, but I was really interested by the room called The Museum of the American Cocktail. I was quite engaged. Details I remember learning from the museum: I learned the name "callabogus" for one of the precursors to the cocktail, and I learned about Jamaica ginger as a patent medicine that got added to cocktails and caused its own special neurological breakdown. Unfortunately, I got kicked out when I was somewhere in Prohibition. Clearly, I need to go back some time when I'm not distracted by food and chatting.